Selling ammo, reloading and sportsman related merchandise. Payment Instructions: At the end of the auction all purchases will be charged to your credit card on file including buyer's premium. A separate charge will appear for packing and shipping at a later date. Ohio Residents will be charged 7.25% sales tax. Internet buyers will be charged for entire packaging and shipping costs. Everything is sold 'as is' and all sales are final. Bidder hereby waives their right to initiate a charge-back on his/her credit card for any reason. Auctioneer reserves the right to charge your credit card at the drop of the hammer. Your invoice will be billed to your credit card following the auction. Any bidder who fails to comply with these terms will be subject to collections from an independent company along with any penalties and fees associated with the service. Descriptions and condition reports are based on a visual inspection of the item. We have made no examination of any internal mechanical workings or firing mechanisms. You should have your firearms inspected and serviced by a qualified gunsmith. Shipping Instructions: All firearms must be shipped to the FFL Licensee of the buyer’s choice. All shipping and handling cost will be charged to the buyer and is calculated as the cost of shipping + $10 handling fee. No firearm will be shipped until a signed copy of the FFL licensee is emailed or faxed to Baer Auctioneers – Realty, LLC. The email to use is wade@baerauctions.com and the fax number is 330-227-3307. Any cost of transfer charged by the buyer’s FFL licensee will be the responsibility of the buyer. PLEASE KEEP IN MIND WHEN PURCHASING AMMUNITION THAT IT IS HEAVY AND THAT THE SHIPPING & HANDLING MAY EXCEED THE PURCHASE PRICE. Preview Date & Times: Preview for this auction will be the day of the auction from 10:00 A.M. to Sale Time. Driving Directions: Located 8 mi East of Lisbon, Ohio or ½ mile West of Rogers, Ohio on State Route 154 to the Rogers Community Auction Inc. 45625 State Route 154 Rogers, Ohio 44445. Thank you for participating in a Baer Auctioneers – Realty, LLC Online Auction. It is important that you become familiar with the terms and conditions as all sales are final. The terms of sale are non-negotiable. Your credit card will be charged for your purchases immediately following the auction. The online buyer's premium is 15%. Ohio residents will pay a sales tax of 7.25% Shipping will be made through USPS when acceptable, all items that cannot be shipped via USPS will be sent via UPS. All shipping charges will be applied and shown as a separate charge to your credit card. There will be a $10 handling charge on all purchases. PLEASE KEEP IN MIND WHEN PURCHASING AMMUNITION THAT IT IS HEAVY AND THAT THE SHIPPING & HANDLING MAY EXCEED THE PURCHASE PRICE. While every effort has been made to ensure accuracy in this catalog, we are not responsible for errors, omissions, deletions or additions. Purchasers are advised to inspect equipment to make their own determination of condition. Neither the Auctioneer nor the Consigners shall be responsible for the correct description, authenticity, genuineness of, or defect in any lot, and make no warranty in connection therewith. No allowance will be made or sale set aside on account of incorrectness, error in cataloging, condition or any imperfection. Registration at the auction (online and/or in person) finalizes each bidder's agreement to the terms and conditions of sale as stated in the Contract and any Addenda which are incorporated by reference into your bidding. Do not bid until you have read the terms and conditions. In order to bid at the auction all Bidders must be signed up and register to bid through Proxibid.com. There is no fee to register although a valid credit card will be required to verify identity and funds. By bidding you are representing to Baer Auctioneers – Realty, LLC, (Auctioneer) and the seller that you have read and agree to be bound by the terms and conditions for this sale as stated herein. If you do not agree with any of the terms and conditions stated DO NOT BID or you will be bound by those terms and conditions. By bidding you agree to all disclosures. Buyers are responsible for knowing the rules and regulations of the state in which they live pertaining to the ownership of firearms. ALL SALES ARE FINAL!! If a firearm is purchased and cannot be shipped to the buyer's state the buyer is still responsible for payment of said firearm and the firearm will be sold at our next scheduled firearms auction. THE SALE WILL BE CONTROLLED BY THE AUCTIONEER PROGRAM. Baer Auctioneers – Realty, LLC. is not responsible for malfunctions or system errors which cause a bid or bidder to fail to be recognized or registered. According to Ohio state law there are no “tie bids” all “tie bids” will be awarded to the bidder in attendance. All items will be sold 'AS IS, WHERE IS' with no financing, inspection or other contingencies to sale. Baer Auctioneers – Realty, LLC. represents the Sellers only and does not inspect properties on bidder's behalf. Buyers must conduct their own due diligence and investigation of each property and must also investigate the suitability of each parcel prior to making a bid and purchase at the auction. Buyers must rely solely upon their own investigation and not any information provided by the Seller or Auctioneer. Failure of a Buyer to be fully informed on the condition of a property will not constitute grounds for any claim adjustment or right to cancel sale. All out of state sales will be shipped to an FFL licensee. All FFL Buyers please bring a copy of current license. All non-FFL purchasers must pass NICS background check screening. All purchasers of firearms must present valid government issued photo identification; the government allows no exceptions. Photo ID must have physical street address; P.O. boxes are not an acceptable form of identification. Purchasers must be at least 18 years old to purchase long guns and long gun ammunition, and 21 years old to purchase hand guns and hand gun ammunition. International Buyers? Yes we will sell firearms and related items (including: ammo, gun parts, scope, reloading equipment and accessories) to international buyers. Anything that is considered a firearm or related to a firearm will need imported please contact the auction company to see if the item(s) you would like to purchase will need exported before bidding. Below are listed two export companies that we work with to export your purchases and only these two. Please inquire as to their fees and process. You are still subject to all of Baer Auctioneers terms and conditions. Buyers must be sure that they can own the firearms they are buying in the Country which they live. www.borderview.com www.weexportguns.com THERE ARE NO REFUNDS OR BID CANCELLATIONS. THE REGISTERED BIDDER IS PERSONALLY RESPONSIBLE, LEGALLY AND FINANCIALLY FOR ALL AUCTION ITEMS BID UPON WHETHER REPRESENTING ONE'S SELF OR ACTING AS AN AGENT. AN ONLINE BID ACCEPTED AT PUBLIC AUCTION IS A LEGAL AND BINDING CONTRACT TO PURCHASE. ANY BIDDER WHO FAILS TO CONSUMATE A PURCHASE WILL BE BANNED FROM BIDDING AT ALL FUTURE SELLER AUCTION EVENTS AND MAY BE PURSUED FOR CIVIL AND/OR CRIMINAL VIOLATIONS. You've been outbid to 9****a! to YOU! You've been outbid to A****m! to YOU! You've been outbid to B****i! to YOU! You've been outbid to T****n! to YOU! You've been outbid to a****e! to YOU! You've been outbid to i****y! to YOU! You've been outbid to b****z! to YOU! You've been outbid to j****1! to YOU! funnel-bullet mold-gun lock-ball starter, etc. You've been outbid to s****9! to YOU! You've been outbid to l****v! to YOU! You've been outbid to D****1! to YOU! You've been outbid to S****o! to YOU! You've been outbid to T****2! to YOU! 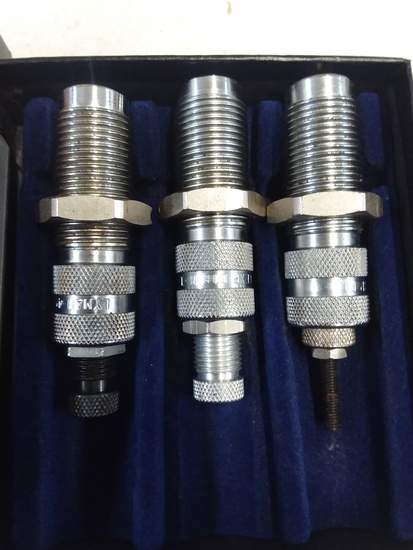 CH tool & die reloading dies (1 RCBS) 44 spl. You've been outbid to g****7! to YOU! You've been outbid to S****d! to YOU! You've been outbid to j****h! to YOU! You've been outbid to D****2! to YOU!